MockupUI allows you to print designs and annotations as full UI specification documents or as slides containing design screenshots only. Select File > Print or click the Print tool button. 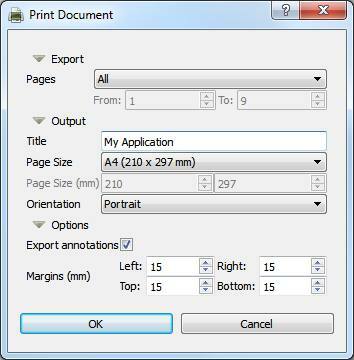 A dialog box will open allowing you to select the printer, the page range you want to print, a scaling method, orientation and page margins. Click Ok to open the Print preview window. Selects the designs to print. All: All designs in the project. Current: Exports only the currently selected design. Range: Specifies a range of designs to be exported. Specifies the title that will appear in the header of the pages. Specifies the page dimensions by choosing from a list of common formats or enter a custom size in millimeters. Selects the page orientation (portrait or landscape). Specifies if the annotations should be printed. If not ticked, only images will be printed. Sets the page margins in millimeters. 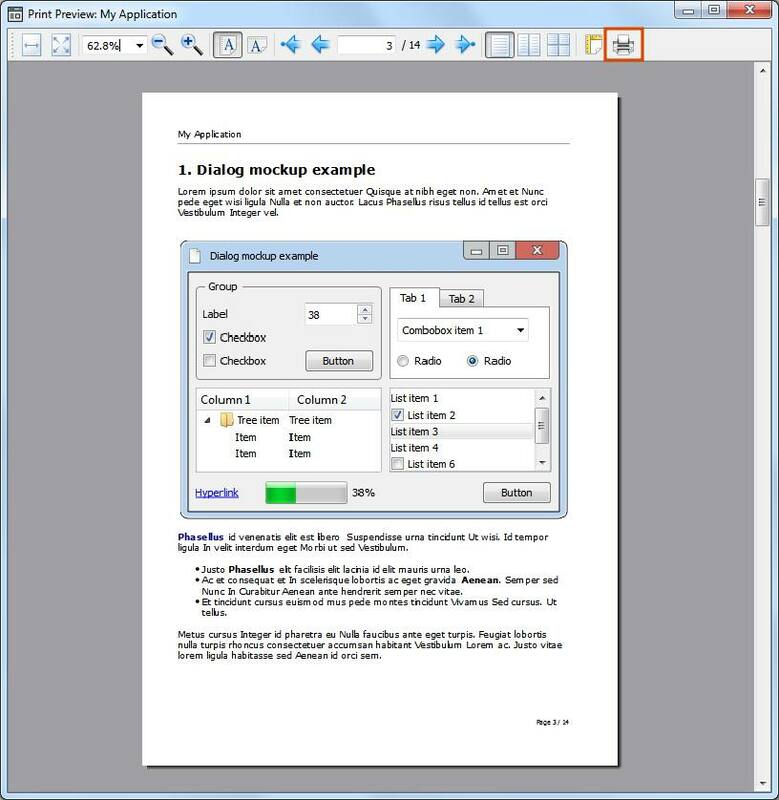 The print preview window is where you can see how the content will be printed and to send the document to the printer. Zoom the preview area to a full page size or page width. Zoom the preview area to a desired scale. Show one page, facing pages or an overview of all pages. Set up page properties (page size, paper source and orientation). Click the Print button to send the document to the printer.